The Wits University precinct – which stretches from Auckland Park to Braamfontein, Milpark and Parktown – has been fertile grounds for a revolution. It’s where the first spark of the #FeesMustFall movement was lit, before going on to become a wildfire that burned throughout the country when other tertiary institutions like University of Pretoria, University of Johannesburg, Tshwane University of Technology, Durban University of Technology, University of KwaZulu-Natal and University of South Africa also joined in. The movement gained so much ground that President Jacob Zuma had to listen, declaring that fees would not increase in 2016. But that was just the first phase of the revolution. It’s still ongoing with wide-ranging issues yet to be addressed, like out-sourcing and making higher education affordable. On February 9, the #FeesMustFall took on football when Busisiwe Seabe invaded Bidvest Stadium, where Bidvest Wits were hosting Kaizer Chiefs, with a flag that had a message about the students’ march in Durban as well as the 1976 Soweto Uprising, where school students across the township took on the apartheid government that forced them to learn in Afrikaans. It was the first time that the movement directly challenged football, despite the Wits precinct housing Bidvest Wits and AmaTuks calling the University of Pretoria in Hatfield home. Previously, it merely “inconvenienced” Wits when their match against Jomo Cosmos was postponed because the university was on high alert. Despite witnessing those marches and students’ clashes with the police and despite their players training at Sturrock Park under the gaze of riot police, the club said nothing about the protests. Their main focus is on the revolution they are looking to mount, overthrowing Chiefs who are the current league champions. But Mamelodi Sundowns, like the riot police in and around the Wits precinct, are having none of that, stomping down any challengers as they look to reign supreme over the country for an eighth term. On the same night, that Seabe invaded the pitch, Bongani Khumalo delivered a Martin Luther King-esque speech. But it wasn’t about the #FeesMustFall movement. It was a football treatise. Khumalo talked about a “dream” to one day see fair officiating after Wits dominated Amakhosi yet still lost 1-0 and were denied what looked like a legitimate penalty. It shows how far Wits have come, from a mid-table club to the one that challenges for the league. If they finish in second place in May, that would be their best finish in the PSL-era since the league’s inception in 1996, but somehow that wouldn’t be good enough with coach Gavin Hunt having instilled a winning mentality in the players.. The only thing missing is silverware, which has eluded the club in the three years Hunt has been in charge. Khumalo – who won a hat-trick of titles with Hunt at SuperSport United, from the 2007/08 season to the 2009/10 campaign – reunited with his mentor in January this year and believes it’s only a matter of time before Wits start winning trophies. 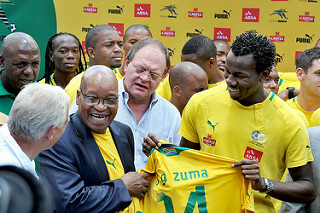 Describing Hunt’s method, Khumalo said: “His culture has remained the same – players who graft. His identity and blueprint is still the same. He is a manager who is always looking to improve, get more knowledge about the game. “He understands the players’ psychology, so he always sets up an environment for a player to improve in. He understands my personality. He knows the game in detail,” added Khumalo. “He was a defender and I am a defender. He is the best coach for me. He points out small things that you might not notice –body position, tactical positioning and other stuff. That’s good for me because I love to learn. I am 29, I played in Europe and in the World Cup but I still want to learn. I still want to grow – for me he is the best coach for that. He keeps me on my toes and I am sure that he will start winning trophies with the club,” Khumalo said. The trophies Khumalo won with Hunt at Matsatsantsa a Pitori took a lot out of the defender, especially the second league title he won while his mother was battling cancer. Playing in the 2009 Fifa Confederation Cup and the 2010 Fifa World Cup demanded a lot more from a defender trying to maintain his sanity and cool because they came after his mother lost her battle, leaving him all alone after his father passed away when he was 13. Which makes the goal he scored against France in Bafana Bafana’s 2-1 victory all the more remarkable. “For a few seconds after that goal I wasn’t part of this world,” Khumalo told The Con. That’s because the World Cup came a year after his mother died on June 11, 2009 – three days after the start of the Confederation Cup, which he played in nonetheless because of the promise he made to his mother. That hard work earned him a five-year contract with English outfit Tottenham Hotspur in January 2011.The dream move turned into a nightmare because Khumalo never made the grade at Spurs and was sent out on numerous loan spells - from Championship sides Preston North End and Reading, to PAOK in Greece, before returning to the English first division to Doncaster Rovers and Colchester United, who campaigned in League One. Khumalo eventually returned to the country last year to join Matsatsantsa before ditching the capital city for Milpark. One of the reasons why things didn’t work out in Europe is that he had to finally deal with the loss of his mother without constant regular games to keep him distracted. The last time Khumalo had to grow up quickly was at SuperSport under Hunt, who made him captain in their last two league triumphs. In that time Khumalo went from being a shy defender to an outspoken leader. His outspokenness, fuelled by confidence, has been his biggest problem in terms of gelling with and being accepted by some people who mistake it for arrogance. It doesn’t help that he has a Model C accent – something that has been used to ridicule him and further alienate him in a game where he doesn’t fit the stereotype. “Now that I have been in the game for so long, a lot of the players are used to me and my personality. I won’t change. I am who I am. But when I started, I had it harder. Some players that I started with might disagree, but they weren’t behind me. Because of my upbringing and background, the way I speak or whatever, there was always this thing that if I made a mistake, it would be twice as bad. I had to work twice as hard as everyone to gain respect. Just because of how I grew up. People forget, I didn’t have it easy. I had personal problems,” Khumalo said. He overcame those problems to play in Europe, no matter how troubled his time was there. Some players retire without achieving that. Going to Europe was achieving a goal he set for himself when Khumalo started at Arcadia Shepherds. It was there that it was drummed into a young Khumalo that Mark Fish also started his career with the Pretoria side before going to play in England and winning the Africa Cup of Nations in 1996 with Bafana Bafana. Khumalo followed that path to England, played in the World Cup and captained the national team in the 2013 Africa Cup of Nations on home soil. But there are still people doubting him. I guess it will take something revolutionary for him to change that. ‘Kill a Jew’ for the Student Movement?